^ Islamic Revolution. Iran Chamber Society. [2010-06-21]. （原始内容存档于2011-06-29） （英语）. 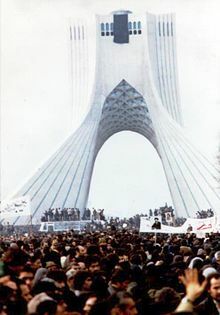 ^ Iranian Revolution. Iranian.com. [2010-06-21] （英语）. ^ The Iranian Revolution. fsmitha.com. [2010-06-21] （英语）. ^ Antony Best. International history of the twentieth century. Routledge. 2004年: 第430頁. ISBN 0415207398 （英语）. ^ Abubakr Asadulla. Islam Vs. West: Fact Or Fiction? : A Brief Historical, Political, Theological, Philosophical, and Psychological Perspective. iUniverse. 2009年: 164. ISBN 0595501575 （英语）. ^ Christian D. Von Dehsen. Philosophers and religious leaders. Greenwood Publishing Group. 1999年: 109. ISBN 1573561525 （英语）. ^ Marguerite Del Giudice. Persia: Ancient Soul of Iran. National Geographic. 2008, 214 (1) （英语）. ^ Daniel Brumberg. Reinventing Khomeini: the struggle for reform in Iran. University of Chicago Press. 2001年. ISBN 0226077586 （英语）. ^ Shaul Bakhash. The reign of the ayatollahs: Iran and the Islamic revolution. Tauris. 1985年: 第22頁. ISBN 1850430039 （英语）. ^ Farhang Rajaee. Islamic values and world view: Khomeyni on man, the state, and international politics 第8冊. University Press of America. 1983年. ISBN 0819135798 （英语）. ^ Thomas M. Leonard. Encyclopedia of the developing world. Taylor & Francis. 2006年: 第863頁. ISBN 0415976626 （英语）. ^ Melvin Eugene Page、Penny M. Sonnenburg. Colonialism: an international, social, cultural, and political encyclopedia. ABC-CLIO. 2003年: 第395頁. ISBN 1576073351 （英语）. ^ Lila Perl. Theocracy. Marshall Cavendish. 2007年: 第23頁. ISBN 0761426310 （英语）. ^ Hasan Yousefi Eshkevari、Ziba Mir-Hosseini、Richard Tapper. Islam and democracy in Iran: Eshkevari and the quest for reform. I.B.Tauris. 2006年: 第13頁. ISBN 1845111346 （英语）. ^ Mohammad Mohaddessin. Islamic Fundamentalism. Anmol Publications PVT. LTD. 2003年: 第20頁. ISBN 8126114207 （英语）. ^ Cyril Glassé、Huston Smith. The new encyclopedia of Islam. Rowman Altamira. 2003年: 第259–260頁. ISBN 0759101906 （英语）. ^ Robin Wright. The Last Great Revolution Turmoil and Transformation in Iran. NYtimes. [2010-06-23] （英语）. ^ Rouhollah K. Ramazani. Revolutionary Iran: challenge and response in the Middle East. Johns Hopkins University Press. 1986年: 第21頁. ISBN 0801833779 （英语）. ^ Tarek Fatah. Chasing a mirage: the tragic illusion of an Islamic state. J. Wiley & Sons Canada. 2008年: 第60頁. ISBN 0470841168 （英语）. ^ Ideology, Culture, and Ambiguity: The Revolutionary Process in Iran. Theory and Society. 1996, 25 (3): 349–388 （英语）. ^ Nazih N. M. Ayubi. Political Islam: Religion and Politics in the Arab World. Routledge. 2004年: 第53頁. ISBN 0203401522 （英语）. ^ Barbara Freyer Stowasser、Georgetown University、Center for Contemporary Arab Studies. The Islamic impulse. Taylor & Francis. 1987年: 第164頁. ISBN 0709933940 （英语）. ^ 63.0 63.1 Ervand Abrahamian. Khomeinism: essays on the Islamic Republic. I.B.Tauris. 1993年: 第30頁. ISBN 1850437793 （英语）. ^ 82.0 82.1 Federal Research Division. Iran A Country Study. Kessinger Publishing. 2004年: 第316頁. ISBN 1419126709 （英语）. ^ Michael M. J. Fischer. Iran: from religious dispute to revolution. Univ of Wisconsin Press. 2003年: 第196頁. ISBN 0299184749 （英语）. ^ Jimmy Carter. Keeping faith : memoirs of a president. Bantam Books. 1983年: 第438頁. ISBN 0553343769 （英语）. ^ Steven F. Hayward. The real Jimmy Carter: how our worst ex-president undermines American foreign policy, coddles dictators, and created the party of Clinton and Kerry. Regnery Publishing. 2004年: 第27頁. ISBN 0895260905 （英语）. ^ Alexander Moens. Foreign policy under Carter: testing multiple advocacy decision making. Westview Press. 1990年: 第145頁. ISBN 0813380715 （英语）. ^ William Shawcross. The Shah's Last Ride. Simon & Schuster. 1989年: 第21頁. ISBN 067168745X （英语）. ^ W. Branigin. Abadan Mood Turns Sharply against the Shah. Washington Post. 1978-08-26 （英语）. ^ Manouchehr Ganji. Defying the Iranian revolution: from a minister to the Shah to a leader of resistance. Greenwood Publishing Group. 2002年: 第14頁. ISBN 0275971872 （英语）. ^ Ervand Abrahamian. A history of modern Iran. Cambridge University Press. 2008年: 第160–161頁. ISBN 0521821398 （英语）. ^ Taru Bahl, M.H. Syed. Encyclopaedia of the Muslim Worlde East. Anmol Publications PVT. LTD. 1996年: 第106頁. ISBN 8126114193 （英语）. ^ James Brown、William Paul Snyder. The Regionalization of warfare: the Falkland/Malvinas Islands, Lebanon, and the Iran-Iraq conflict. Transaction Publishers. 1985年: 第128頁. ISBN 087855985X （英语）. ^ Abdar Rahman Koya. Imam Khomeini: Life, Thought and Legacy. The Other Press. 2009年: 第44頁. ISBN 9675062258 （英语）. ^ Rhodri Jeffreys-Jones、Christopher M. Andrew. Eternal vigilance? : 50 years of the CIA. Taylor & Francis. 1997年: 第158頁. ISBN 0714643602 （英语）. ^ Michel Foucault. What Are the Iranians Dreaming About?. Chicago: University Press. 1978年 [2010-06-27] （英语）. ^ چرا و چگونه بازرگان به نخست وزیری رسید؟ 互联网档案馆的存檔，存档日期2008-04-13. ^ Iran marks 20th anniversary of Islamic revolution. CNN. 1999-01-31 [2010-06-29] （英语）. ^ Sepehr Zabih. Iran since the revolution. Taylor & Francis. 1982年: 第2頁. ISBN 0709930003 （英语）. ^ Asghar Schirazi. The constitution of Iran: politics and the state in the Islamic Republic. I.B. Tauris. 1998年: 第93–94頁. ISBN 1860642535 （英语）. ^ Matthew Broyles. Mahmoud Ahmadinejad: President of Iran. The Rosen Publishing Group. 2007年: 第33頁. ISBN 1404219005 （英语）. ^ Nikki R. Keddie、Eric James Hooglund. The Iranian Revolution and the Islamic Republic: Proceedings of a Conference. Middle East Institute in cooperation with Woodrow Wilson International Center for Scholars. 1982年: 第101–124頁. ISBN 091680819X （英语）. ^ Ḥamīd Anṣārī、Muʼassasah-ʼi Tanẓīm va Nashr-i Ās̲ār-i Ḥaz̤rat Imām Khumaynī、Umūr-i Bayn al-Milal. Narrative of Awakening : A Look at Imam Khomeini's Ideal, Scientific and Political Biography from Birth to Ascension. Institute for Compilation and Publication of the Works of Imam Khomeini, International Affairs Dept. : 第165–167頁 （英语）. ^ Jeffrey Haynes. Routledge handbook of religion and politics. Taylor & Francis. 2008年: 第122頁. ISBN 0415414555 （英语）. ^ Parvin Paidar. Women and the Political Process in Twentieth-Century Iran. Cambridge University Press. 1997年: 第229頁. ISBN 052159572X （英语）. ^ Mark Bowden. Guests of the Ayatollah: The First Battle in the West's War with Militant Islam. Atlantic Books. 2007年: 第487頁. ISBN 1843544962 （英语）. ^ Efraim Karsh. The Iran-Iraq War. The Rosen Publishing Group. 2008年: 第70頁. ISBN 1435874994 （英语）. ^ Grolier. Encyclopedia Americana 第15冊. Grolier. 1994年: 第386頁. ISBN 0717201252 （英语）. ^ Dilip Hiro. The longest war: the Iran-Iraq military conflict. Routledge. 1991年: 第255頁. ISBN 0415904072 （英语）. ^ H. E. Chehabi, Rula Jurdi Abisaab. Distant relations: Iran and Lebanon in the last 500 years. I.B.Tauris. 2006年: 第208頁. ISBN 1860645615 （英语）. ^ Mahmood T. Davari. The political thought of Ayatullah Murtaża Muṭahhari: an Iranian theoretician of the Islamic state. Routledge. 2005年: 第74頁. ISBN 0415341590 （英语）. ^ William Shawcross. The Shah's Last Ride. Simon & Schuster. 1989年: 第110頁. ISBN 067168745X （英语）. ^ Vali Nasr、Seyyed Vali Reza Nasr. The Shia Revival: How Conflicts Within Islam Will Shape the Future. Norton. 2007年: 第138頁. ISBN 0393329682 （英语）. ^ Robin B. Wright. In the name of God: the Khomeini decade. Simon and Schuster. 1989年: 第126頁. ISBN 0671672355 （英语）. ^ Thomas Paterson、J. Garry Clifford、Shane J. Maddock、Deborah Kisatsky、Kenneth J. Hagan. American Foreign Relations: A History, Volume 2: Since 1895. Cengage Learning. 2009年: 第409頁. ISBN 0547225695 （英语）. ^ Karl R. DeRouen, Uk Heo. Defense and security: a compendium of national armed forces and security policies 第1冊. ABC-CLIO. 2005年: 第319頁. ISBN 1851097813 （英语）. ^ Judith Palmer Harik. Hezbollah: The Changing Face of Terrorism. I.B.Tauris. 2005年: 第40頁. ISBN 1845110242 （英语）. ^ Vali Nasr、Seyyed Vali Reza Nasr. The Shia Revival. Norton. 2007年: 第141頁. ISBN 0393329682 （英语）. ^ Encyclopaedia Britannica, inc. Iran: the essential guide to a country on the brink. John Wiley & Sons. 2006年: 第212頁. ISBN 0471741515 （英语）. ^ Jane Howard. Inside Iran: women's lives. Mage Publishers. 2002年: 第89頁. ISBN 093421171X （英语）. ^ Daniel Brumberg. Reinventing Khomeini: the struggle for reform in Iran. University of Chicago Press. 2001年: 第189–190頁. ISBN 0226077586 （英语）. ^ Lila Azam Zanganeh. [My sister, guard your veil; my brother, guard your eyes: uncensored Iranian voices My sister, guard your veil; my brother, guard your eyes: uncensored Iranian voices] 请检查|url=值 (帮助). Beacon Press. 2006年: 第63頁. ISBN 0807004634 （英语）. Brendan January. The Iranian Revolution. Twenty-First Century Books. 2008年. ISBN 0822575213 （英语）. Jahangir Amuzegar. 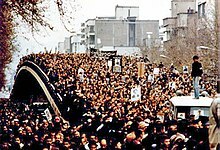 The dynamics of the Iranian revolution: the Pahlavis' triumph and tragedy. SUNY Press. 1991年. ISBN 0791407314 （英语）. Said Amir Arjomand. The turban for the crown: the Islamic revolution in Iran. Oxford University Press US. 1988年. ISBN 0195042581 （英语）. Ervand Abrahamian. Iran Between Two Revolutions. Princeton University Press. 1982年. ISBN 0691101345 （英语）. Cheryl Benard、Zalmay Kalilzad. The Government of God: Iran's Islamic Republic. Columbia University Press. 1986年. ISBN 0231053770 （英语）. Desmond Harney. The priest and the king: an eyewitness account of the Iranian revolution. I.B.Tauris. 1999年. ISBN 1860643744 （英语）. 陳安全. 《伊朗伊斯兰革命及其世界影响》. 復旦大學出版社. 2007年. ISBN 7309053605 （中文（简体）‎）. Edward Shirley. Know Thine Enemy: A Spy's Journey Into Revolutionary Iran. Westview Press. 2007年. ISBN 0813335884 （英语）. Sandra Mackey. The Iranians: Persia, Islam and the soul of a nation. Plume Book. 1998年. ISBN 0452275636 （英语）. Robert Graham. Iran, the illusion of power. Taylor & Francis. 1979年. ISBN 0709901879 （英语）. Charles Kurzman. The unthinkable revolution in Iran. Harvard University Press. 2004年. ISBN 067401328X （英语）. 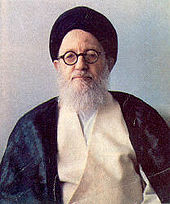 Amir Taheri. The Spirit of Allah: Khomeini and the Islamic revolution. Adler & Adler. 1986年. ISBN 091756104X （英语）. Baqer Moin. Khomeini: life of the Ayatollah. I.B.Tauris. 1999年. ISBN 1850431280 （英语）. Fereydoun Hoveyda、National Committee on American Foreign Policy. The Shah and the Ayatollah: Iranian mythology and Islamic Revolution. Greenwood Publishing Group. 2003年. ISBN 0275978583 （英语）. Asghar Schirazi. The constitution of Iran: politics and the state in the Islamic Republic. I.B. Tauris. 2003年. ISBN 1860642535 （英语）. Nikki Keddie. Modern Iran: Roots and Results of Revolution. Yale University Press. 2003年 （英语）. Hamid Dabashi. Theology of discontent: the ideological foundation of the Islamic Revolution in Iran. Transaction Publishers. 2006年. ISBN 1412805163 （英语）. Ruhollah Khomeini、Hamid Algar. Islam and revolution: writings and declarations of Imam Khomeini. Mizan Press. 1981年. ISBN 0933782047 （英语）. Robin Wright. The Last Great Revolution: Turmoil and Transformation in Iran. Vintage. 2001年. ISBN 0375706305 （英语）. Shaul Bakhash. The reign of the ayatollahs: Iran and the Islamic revolution. Basic Books. 1986年. ISBN 046506888X （英语）. Olivier Roy、Carol Volk. The failure of political Islam. BHarvard University Press. 1996年. ISBN 0674291417 （英语）.